Doctors have found that by gently elevating the upper body on a slight incline, we are able to utilize gravitational forces to keep acid and stomach contents where they belong – in the stomach. so we turn to all sorts of wedges that bring a whole new level of problems. Inflatable wedges are easy to fail and expensive to replace. Are uncomfortable for sleeping in any position, except on your back (the most painful position and exacerbates the problem. Studies have shown that sleeping on your left side is preferable). Wear and Tear requires maintenance, often replacement. A good nights sleep is important for our health. Therefore, we spend weeks searching for the right mattress. – After successfully identifying and getting use to the perfect mattress, – would you want to swap your mattress for an inexpensive, untested wedge to sleep on? Right! We didn’t think you would. 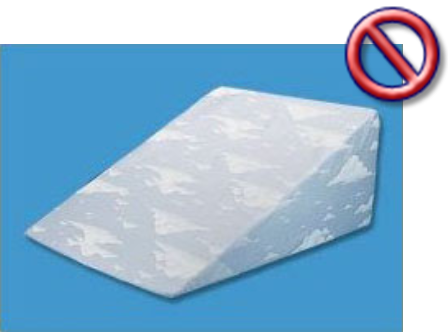 See full list “Disadvantages of pillow wedges”. Are too long Causing the Mattress to slip off. Eliminating the possibility of adjusting height and angle. The makers of REFLUX GUARD understand because they have suffered this same condition. How REFLUX GUARD© Compares To Other Products? Unlike the pillow wedges sold by competitors, REFLUX GUARD© is a full, mattress-width sized wedge which fits under the mattress. We perfected REFLUX GUARD© after trying several of these other products unsuccessfully. Because of its small size, it is uncomfortable to sleep on a pillow wedge in any position except on your back. For most acid reflux sufferers, this is the most painful position and exacerbates the problem. If you can manage to sleep on your stomach, the wedge forces you to bend, which puts pressure on it. The REFLUX GUARD© full mattress wedge allows you to sleep in any position because you are lying on your mattress – not a wedge. 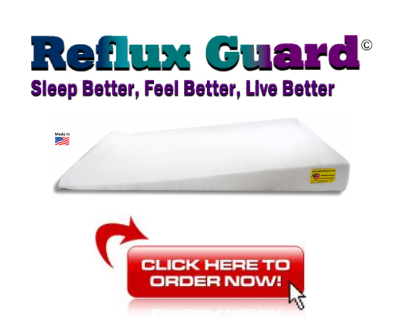 > Reflux Guard is 60″ long, the Not so full length provides additional stability to help the mattress from sliding off. > The head of the Reflux Guard is 6″. If you need higher the Reflux Guard is adjustable and can be slipped down and raise the 6″ to 7″ plus. Because you actually lie right on a pillow wedge, the cover must be washed often and the wedge itself must be replaced often due to wear. REFLUX GUARD© fits under the mattress. You can leave it in place for years. We know this from personal experience and therefore offer a TEN YEAR WARRANTY*. How long a warranty does any pillow wedge offer? You could pay $79.99 to $199 for a pillow wedge which would last you about two years. That works out to $40-$100 a year for a semi-comfortable, semi-effective product. Or you could buy REFLUX GUARD© with a TEN YEAR WARRANTY* for a completely comfortable, completely effective solution and pay under $18 a year or less than 5 cents a day!